Mega Fishing Thailand - Freshwater fish species identification and taxonomy pages. Here you will find information about the main game fish species that anglers fishing in Thailand may encounter like catfish, carp and snakehead aswell as other native freshwater and brackish water species. We also have pages dedicated to the many non-native (Invasive) fish species that have been introduced into Thailand's freshwater lakes, rivers and fishing parks. There are hundreds more diverse and interesting fish species in Thailand and surrounding Malaysia, Cambodia, Vietnam (Mekong Delta), Laos and Burma, our fish index has only really just begun to expand. Thailand really is the land of the giants as far as freshwater fish go and home to some very exotic tropical fish species both small, large and humongous. Four of the largest freshwater fish on earth are all residents in Thailand's lakes and rivers. The largest catfish in the catfish family which also happens to be the largest freshwater fish in the world the Giant Mekong catfish (Pangasianodon gigas) which can grow in excess of 350kg (770lb) is native to Thailand's waters. The mother of the carp family the Giant Siamese carp (Catlocarpio siamensis) which can grow to or 300kg (660lb) also is native to Thailand. Another top contender for the largest freshwater fish on the planet the Giant freshwater stingray (Himantura chaophraya) which is reported to have a maximum weight of 350kg (770lb). The largest freshwater predatory fish in the world the mighty Arapaima (Arapaima gigas) (Heavily publicized as the largest actual freshwater fish but there is little recorded evidence of fish caught to match the size of the Mekong catfish) which can grow to over 250kg (550lb). 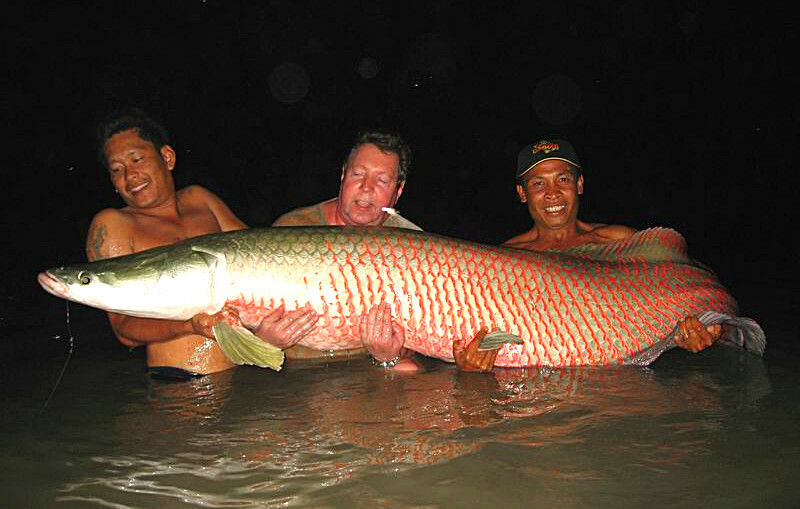 The Arapaima is know as Pirarucu in its native South American Amazon and has been successfully imported into a rapidly growing number of fishing lakes, resorts and parks right across the country. The world's largest freshwater fish is the Giant Mekong catfish (Pangasianodon gigas). This one is about 80kg (176lb) and was caught fishing in Thailand at Bungsamran lake in Bangkok. Last but by no means least, the Chao Phraya Catfish or the Giant Pangasius (Pangasius sanitwongsei) are classed as benthopelagic fish. They constantly cruise through the water column searching for live prey, also scavenging on what ever they can find which is edible. Voracious predators also know as the "Dog Eating Catfish", In their natural habitat of the Chao phraya river Pangasius sanitwongsei have evolved to be very strong muscular swimmers in order to survive in such a large deep powerful river. Extremely hard fighting and fast fishes, can be seen sometimes just by the top of their dorsal fins breaking the surface of the water, almost shark like as they cruise around looking for food.